I don't write a lot about the Albany beer scene. Yeah, yeah. I know the Albany Ale Project. That's not what I'm talking about. That doesn't count. I'm talking about the current Albany beer scene. I'm a dad and husband, so that keeps me from hopping over to the Ruck for a home brew tasting or heading to the City Beer Hall for their wild game and beer pairings. Those are events for the single-lifers or parents of teenagers. I write about the beery things I can see from my backyard. That, and a number of you out there, don't live in Albany, so, me writing about this fair city is the bloggy equivalent of looking at my vacation photos. This week, though, a series of beery events has gotten me thinking about the current state of beer in Albany. First, I had the pleasure and honor to speak at the University Club of Albany. It was a truly fantastic event. Colleen Ryan, the Club's event coordinator, and vice-president, had heard about the Albany Ale Project and asked if I'd come and do my spiel for the evening—including a taste through the seven beers I think define New York's brewing legacy. 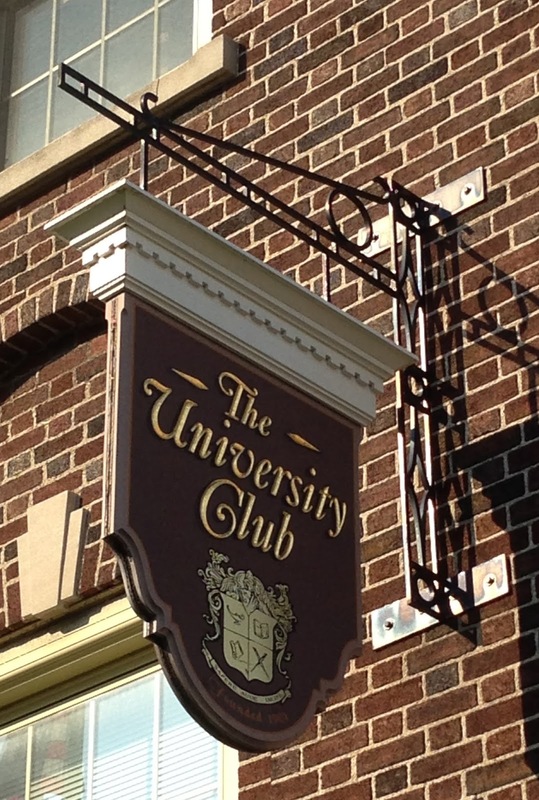 The University Club started, well, clubbing in 1901 and has been an Albany landmark ever since. It has quite a beer-related connection to the city as well. The Club bought the Amsdell mansion, home of George Amsdell, the co-owner of Amsdell Brothers brewery, and made it their home in the early 20th-century. 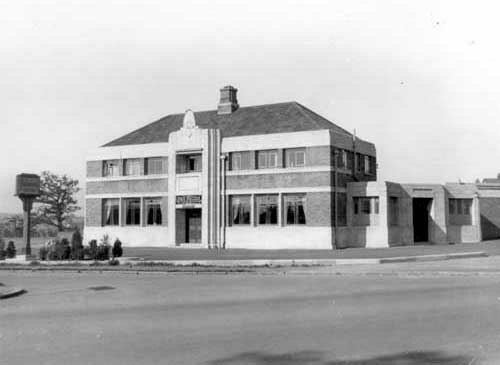 That house burned in 1923, and was replaced by the building that stands there now. On a slightly self-involved side note, William Howard Taft and Andrew Carnegie have also spoken at the University Club… and me. It was a really fun beery night! In any case, back to the point. Speaking in front of a crowd of 35 or so beer loving Albanians—riveted on my every word I might add—in a building so closely connected to history and people of the city of Albany, got my wheels turning. And the rest of the week provided fuel for the fire. Bill Dowd, of Dowd on Drinks and Notes on Napkins (and apparently also the king of alliteration) has recently proposed a Capital Region Brew Trail. Greg Black, one of the Beer Nuts on the TU's blog of the same name, is also waving that flag. 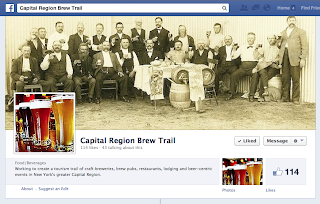 These two are suggesting, in the words of the CRBT's Facebook page, a tourism trail of craft breweries, brew pubs, restaurants, lodging and beer-centric events in New York's greater Capital Region. Hmm. 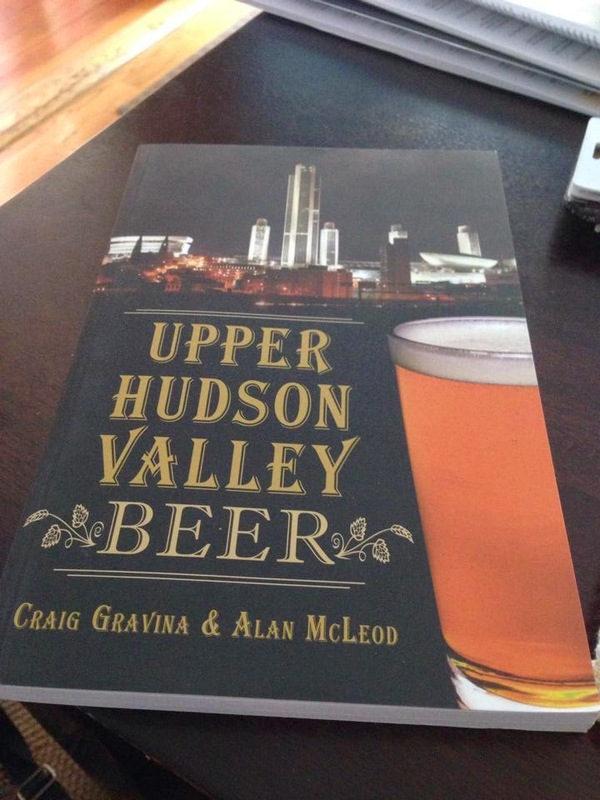 Beer-centrism in the Capital Region. It was also announced this week that Bell's Brewery will begin distributing into New York, as of October first. I think one might argue that Bell's Two Hearted Ale may be one of the most pospular craft brews in the country right now. It's always great to see new beer in the area. Harpoon IPA is the normal craft beer in town. Fenway. The Four's. Union Oyster House. A Cheesecake Factory. My relatives' fridge. Citizen Public House. It is everywhere. Every town should have a normal good beer but not all do. Allagash White is pretty pervasive in Portland, Maine where we head next. Not sure Albany has one yet. Ithaca sure likes its Cascazilla. See, that second to last sentence? "Not sure Albany has one yet." That's what I'm on about. Why doesn't Albany—or at the very least the Capital Region—have its own beer. We have the history—400 years of it actually. We have the demand. All those folks willing to come out on a Tuesday night to listen to me prattle on about the glory days of beer in Albany—let alone The CRBT's Facebook page topping 100 likes within a matter of hours of being posted. Hell, drinkdrank's Facebook page only has 61 likes and that's been up for a year. And to quote Oscar Madison, "We have the technology." Yet, I'm still left asking, where is "our" beer? It's buried in the unadventurous fermentation tanks of local brewers who must bend to the dollar of the uneducated and uninitiated beer drinkers that make up the majority of our market...unfortunately. We've all seen Brown's, Davidson Brothers and Olde Saratoga in local establishments from time to time but there is not a single beer in any of their lineups that deserves to be the beer that represents our area. And these other cities don't just back an individual beer, it's about the brand and it's about supporting something local with the stipulation that it be worthy of representing the area. Honestly I don't even know if our region is willing to back any one brand because frankly there is no such thing as Capital Region pride (hear me out). I mean this all in a very tongue in cheek sort of way but you have to admit it's true for a lot of people. If you live in Albany, you hate everyone else for coming to your city during the day, taking your parking spot and then leaving at night. If you live anywhere else you view Albany as a cesspool of crime and NYS corruption. You see Saratoga as a crowded yuppy town and everything outside of that stretch is just farm. I'm not going to get into Troy or Schenectady because this movement would have to start in Albany. Again, I know it's not everyone but there is a reason Albany was voted as one of the most unfriendly cities in the US. Before someone raises their hand and asks "But what about Shmaltz?" Let me say that while Shmaltz has a decent lineup (that DOACB is excellent), their origin and shtick alienates them from the Capital Region; built on the west coast and catering to a much larger audience already, there is no way they would be embraced as "our" beer. Then you'll ask "What about The Beer Diviner?" Some of the pieces are there (experimental styles, local content) but the branding isn't tied to the region, they're about 40 minutes east of Albany, and so far the beers they've released for sale outside of their tap room are middle of the road (sorry guys) so it's a long shot. Of all the current breweries that I think would be easiest to embrace (not necessarily has the best chance of doing it) C.H. Evans makes the most sense. The history is there (for another time), the location is perfect, the building is amazing, the customer base is healthy, the branding is decent and a big piece of the puzzle...they just changed head brewers (no insult to George, he makes quality beer). However, I don't know what kind of control the Pump Station management has over the brew house and I don't know if their new head brewer, Ryan Demler, is allowed to just do whatever he wants. We've already seen more experiments from him in his short time than we ever saw with George so it's a good sign and hopefully it keeps going in that direction. One more problem there is capacity; they do not distribute and with the 10 barrel system that they have they can't make enough beer to satisfy The Pump Station and other customers. They would have to change their whole philosophy and go from being a restaurant that brews beer to a brewery that has a restaurant. But from a reality standpoint, Brown's makes a lot of sense. Also a decent history in the area, great customer base, wide variety, existing distribution and they are investing in an additional 57,800 barrels of capacity locally. Most of their beer is mediocre and the quality/flavor seems to fluctuate batch to batch and year to year BUT they have a few good beers that could take them places if they were just slightly better (I'm looking at you Whiskey Porter, Cherry Raspberry and Imperial Stout). And I haven't had it myself but I hear great things about their Iron Horse IPA which is only being served at Joseph Bruno stadium. We also have Ravenshead coming to the area...just down the road from Albany, who knows what could happen there. Just please oh please don't let the lineup be like all the others; if I see another Pilsner/Cream Ale, Pale, IPA, Red, Oatmeal Stout, Wheat, Seasonal menu again I'm going to cry. Do a saison, a sour, an Imperial anything, a west coast style IPA, a dark lager (a dark anything for goodness sake), a dopplebock, a belgian stout, scotch strong ale, use rye, use fruit, use herbs, do something with chilis, new hops, just do anything but please oh please don't censor yourself for the sake of making something "approachable". Anonymous—tell us what you really think. Sorry for the rant but sometimes it just feels like the breweries in this area are just cruising and we deserve better and need to start demanding it. Although, I don't think it's a question of Capital Region pride, but rather one of identity. I'm a little more Central NY, but Saranac Pale Ale is decent, widely accepted, drinkable, distributed everywhere, and affordable. Utica is not really anyplace anyone wants to spend any time in, but they certainly provide a beer that could be an identity brew for Upstate NY. I just got back from a few days in the ADKs and drove through Utica on the way. While there, I enjoyed a sample pack from Adirondack brewery in Lake George. The Rock the Boat Ale was well done and tasted similar to a fruit belgian that I homebrewed earlier this year. Saranac Pale Ale is maybe in fact now an "identity brew" for upstate New York, or at least the one with a craft image. I'd argue the other one, with a more standard-brrwery image, is Genny Cream Ale. From Albany to Dunkirk, NY the latter is known by most beer drinkers who still cast an eye to region.  The other as well but again with a new-style crafted image albeit made by an old regional, Matt Brewing. The Saranac line comprises so many extensions that I think had the Pale Ale stood on its own it would enjoy even a higher status than now, but it's good to have the choice. I have to check (looking at the more recent thread) if Jess's pages canvass Genessee Brewing Company, Simon Pure in Buffalo, Fred Koch in Dunkirk et seq et seq - there is a ton of brewing history on the western side too. One book on Buffalo brewing history somewhere in my library has an evocative set of black and white photos of all the disappeared Buffalo breweries - often big castellated buildings looking like that something out of Bavaria plunked in the American heartland. Genny Cream Ale has reputation among NY beer drinkers for producing the "Genny Screamer" the morning after enjoying a "session" of the product. Session has such a nicer connotation than binge and Genny Screamer is about as nice a way as you can describe the after effects of overindulgence. I didn't know that but surely these are hoary stories that seem to be part of local beer mythology without rhyme or reason or at least any current rationale. I drank it for years in the Flower City and Finger Lakes and never had such experiences. I would think too the bottled and probably the draft must be pasteurized, so... It's not a world-beater but a fresh schooner - it's cream ale so let's keep with an older idiom - is a certain taste of U.S. brewing history and it has its place! If I'm not mistaken, Craig once mentioned he had a fondness for it. I heard they re-issued 12 Horse but that it isn't that distinctive apparently: such a pity. I am sure in 1950, say, it was a fine beer. Is it possible it was never a truly distinctive beer? Somehow I don't think so.. I actually prefer the 12 Horse Ale to the cream ale. It isn't widely available, I think it might be a seasonal or anniversary type release. We always joked that they used water straight from the Genessee River to brew. Any of the Genny products are better tasting and cheaper than the overpriced swill from St. Louis. Where were you guys when I put up my post on the seven beers that defined NY brewing over the last 100 years, or so? I commented on that post. I enjoyed that piece and thought that your choices were accurate. Maybe I commented under anonymous, but I don't think so. Very good, I did see it but the fragmentary nature of blog reading can lead to memory gaps! Well done to identify the main (current) contenders and indeed I'd add Ommegang (brewery not brand is enough for this purpose) as co-holder of the craft title in this regard! Line up the schooners! (Ommegang in a schooner? Sure why not. :)).